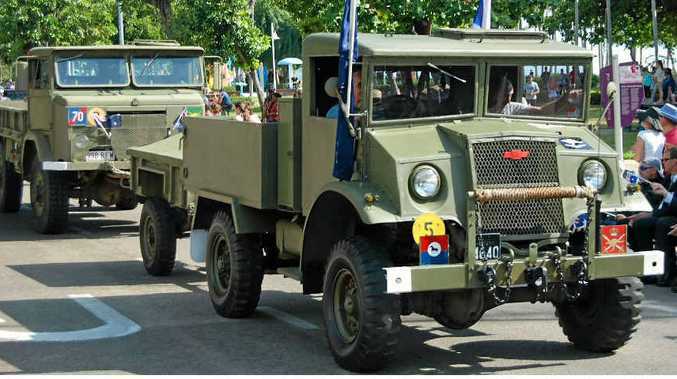 ON THE ROAD AGAIN: A 1944 Chevrolet Blitz was a popular vehicle as it made its way down Townsville’s Strand on Anzac Day. MORE than 30,000 men, women and children watched historical trucks during the huge street parade along Townsville's Strand on Anzac Day. These trucks were provided by members of the local Military and Historical Vehicle Club. They included a 1944 Studebaker US6 which is in original condition and was used in the movies Thin Red Line and Australia. It is owned by Col Feather and is, co-incidentally, up for sale. The John Thomas-owned 1944 Chevrolet Blitz, which was a radio vehicle during the Second World War proved popular. It was sold off by the Army after the war, and bought by a rural property owner and was cut down and used in the construction of a dam. It was bought by Kevin Graham of Townsville for $300 six years ago. At this time it hadn't run for 20 years, and Kevin was told it would be an impossible task. However, Kevin is a mechanic by trade, and thought he would give it a go. He found the motor to be "not all that bad" and procured parts from "all over", with some coming from Ingham, and others from NSW. He restored the vehicle and reconditioned the motor. Mr Feather also owns the 1944 Ford Blitz F30 Ambulance "Australia No.2" which has been restored and is one of three in the world still running. Mark Eardman's 1968 International MK4 was thought to have been in the Vietnam War and was used by the Rupertswood Rural Fire Brigade and at that time was painted bright yellow. Mark restored it back to original condition and is still looking for hood bows for it. There were old cars, motorbikes, and wartime jeeps in the parade.